Every Pokemon is interesting and worth talking about. I don’t play a ton of Pokemon, but I do enjoy the universe and I love learning more about the creatures in it. So, Here’s Another Pokemon! It’s Croagunk! Anything that attacks using its fingers as flesh knives sounds scary. That becomes even more true with Croagunk, who has poison sacs inside its fingers. According to Pokedex entries, this frog-like Pokemon rarely attacks. Some might think that this is because they are peaceful or non-aggressive. I think it’s because nobody wants to get into a fight with it. Who wants to be stabbed with poison fingers? Whatever their reasons, Croagunk are relatively peaceful and due to their colorful skin they’ve become popular mascots in the Pokemon universe. While the poison found in Croagunk’s fingers and cheeks might be toxic and even deadly, it can also have some medicinal benefits. According to Pokedex entries, many back-pain remedies rely on Croagunk poison. I do have to wonder who figured this out. My guess: Somebody suffering from back pain pissed off a Croagunk and tried to run away. The thing leaped at them and jabbed him with their fingers. Luckily the man survived and also discovered his back was feeling pretty good. In the anime a Croagunk was caught by Brock. This Croagunk would stab Brock every time he fell in love with a beautiful woman. If you know anything about Brock, you know that means a lot of finger jabbing. I don’t want to write the phrase “finger jabbing” ever again. I’m happy that Pikabeans drew something that I was thinking about the moment I saw this Pokemon. Why does it have colored middle fingers? I just immediately thought about what it would look like flipping the bird and thankfully this artist created that image for me. Thanks Pikabeans! 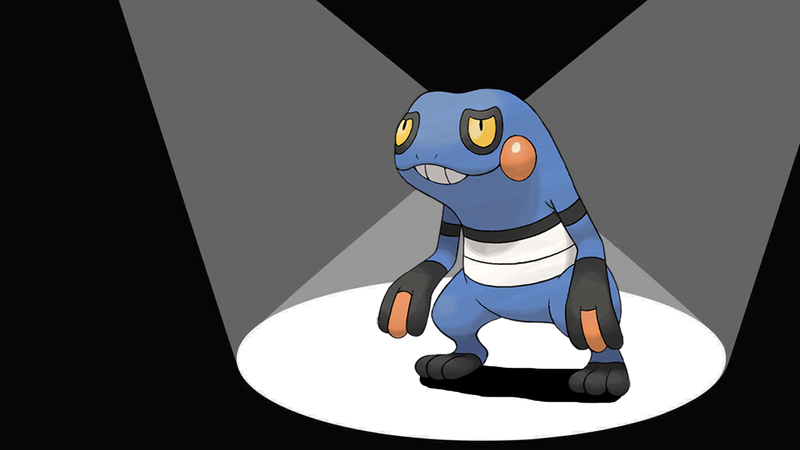 In China Croagunk is named Bù Liáng Wa which, according to Bulbapedia, translates into “bad frog”. Seems a little harsh. Croagunk is the mascot Pastoria City, which is located in a swamp. According to Pokedex entries, Croagunk makes “eerie” noises using their poison sac cheeks. So not only does it stab you, it also makes creepy noises. Maybe China is right.